Are You Superstitious When It Comes To Bingo? It can get on your nerves when you see a fellow bingo player winning constantly and you always think why they seem to have more luck than you. People can become very superstitions at bingo halls and even when playing online bingo at William Hill, you may find yourself picking up on some kind of superstitions as well in the hope of winning more game. 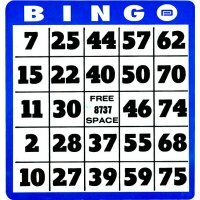 You may actually think you appear to have more “luck” and win more bingo because of such superstitions. Some people believe in superstitions and others believe they are nonsense but to bingo players if they win and use something like a lucky charm, to them they believe the win was down to the lucky charm. It does get you thinking if suddenly one day you win more just because of a new superstition you picked up. To others bingo it is just a game of luck and no lucky charm will change this, but hey, what’s the harm? Picking The Correct Seat | Lucky Charms | Bingo A Game Of Chance | What Next? Yes, you heard correctly. Finding a lucky seat is a big superstition at bingo halls. If you win constantly one day in a particular seat and then next week win nothing in a different seat you have a state of mind that your winning was because of last week’s seat. Every week from then on you may try to get the same seat every week and it is a must for you. If someone else should sit in that seat you may believe that they now have “the powers” of this seat. You will be surprised how many bingo players will bring lucky charms to a bingo hall and wear when playing bingo online. Everyone will have a different charm to someone else but to the player themselves their lucky charm is what brings them their luck. These items can range between anything from a simple bracelet or ring, to a pair of luck socks or garment. Some players even have lucky numbers and if their cards have that number then that card is sure to win. Bingo Is Just A Game Of Chance Isn’t It? If you add all the cards in a game and then divide this by all the cards you purchase in the same game you will get the odds of you winning that game. Keep in mind that it only takes 1 card to win a game and by buying more cards does not guarantee a win. The balls that are being called are at random and a ball cannot be predicted to come out next over another ball. Just because the number 5 came out first in the last 3 games does not mean it will come out again or will probably not come out for a long time. This was just down to coincidence and something that is just down to chance. For some players this is the best part of the game that no one has control over who will win next. Every bingo player is different weither they are superstitious or if they believe that bingo is down to chance and the only way to improve one’s odds is to buy more tickets and play against less players. It does not matter what category you fit it just as long as you have fun and enjoy the game. Also, note that both superstitions and odds also apply in playing online bingo and at a bingo hall.